An icy blast from the North Pole, welcomed Citroens latest new model the C5 Aircross to the UK recently. Over the past two years, Citroen has realigned it’s model range, moving away from a range of MPV’s & into SUV’s. Alongside it’s revamped van range with new Dispatch & Berlingo also launched since 2016, Citroen sold 75,111 vehicles in the UK in 2018 giving them a 2.75% market share. The French manufacturer has seen five years of growth & the new C5 Aircross has arrived to further cement it’s position in the marketplace. 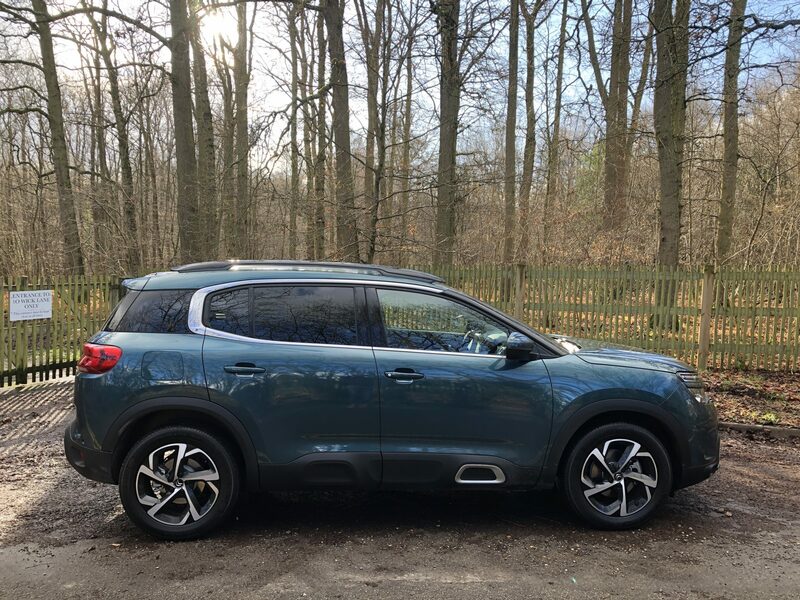 C5 Aircross mirrors the family look of Citroens latest new car models & features the familiar Citroen front grille & distinctive design found on sister models the C3, C4 Cactus & C3 Aircross. It enters the highly competitive C-SUV sector, which has seen European sales increase from 4.5 million sales in 2012 to over 11 million by 2018. Plainly, this is a sector that all of the major players need to be in & Citroen are no different. All of Citroens recent new car launches have featured Citroen Advanced Comfort, in a way a throwback to Citroens of old, putting comfort & function above performance. The C5 Aircross is no different, coming as it does with five individual seats, class leading boot space & on trend tech & safety. There are two petrol & two diesel engines on offer, with a plug-in hybrid due in 2020. The petrol engines are a 128bhp 1.2-litre PureTech 130 & a 177bhp 1.6-litre Puretech 180. The 130 version is only available as a six-speed manual, while an eight-speed automatic gearbox is offered on the 180. If you prefer diesel, then Citroen is offering a 128bhp BlueHdi 130 engine with a six-speed manual or eight-speed automatic gearbox. You can also opt for the more powerful 178bhp BlueHdi 180 engine that only comes with the eight-speed automatic. In line with other Citroen cars, there are three specs; Feel, Flair & Flair Plus. The Feel trim package is offered on the 1.2-litre, petrol engine or the 1.5-litre BlueHDi diesel engine, with the petrol starting at £23,225. Mid range Flair trim starts at £25,325 for the manual 1.2-litre petrol version & you can also have Flair spec with all engine choices. Range topping Flair Plus starts at £27,725 again with the 1.2-litre petrol unit with all engines available with this spec. The interior mimics the smaller C3 Aircross with a logically designed dashboard featuring a large centre touchscreen & even larger digital display in front of the driver. The steering wheel controls allow you to select which function you want to view, with a choice of amongst others, Driving Info, SatNav & Dials which allows you to choose from several dial options for the speedo & rev counter located within the 12.3” customisable TFT instrument display. The large centrally located 8″ touchscreen, is standard across the range, as is Apple CarPlay & Android Auto. Entry level Feel offers 17″ alloys, rear parking sensors & autonomous emergency braking. Flair adds 18″ alloys, a dash cam, SatNav & tinted windows. Range topping Flair Plus includes keyless entry, a panoramic sun roof, wireless phone charging & an automatic boot hatch. Cabin space is good. All five passengers gets their own seats, with plenty of head & leg room both front & rear. The three rear seats can be moved individually fore & aft, although we found the seat depth front to back, quite shallow. The door pockets are huge, plus there’s a couple of drinks holders behind the gear stick, a smallish glove box, a deep storage bin which doubles as an armrest & a small open cubby where the USB & 12v socket are located. Rear passengers get twin air vents & a USB connection in front of the rear centre passenger. The boot is cavernous, with 580 litres of volume on offer with all five seats in place, which increases to 1630 litres when you fold down the rear three seats down. Double-laminated front windows and engine bay soundproofing aim to reduce exterior noise, while an active air quality system uses an air-purifying carbon filter. First up we drove the Flair Plus Blue HDi 130 6 speed manual diesel, which costs £29,225 & comes with attractive CO2 emissions of 108-110g/km & a BIK of 26%. With two front seat adults on board, we drove a mixed 66 mile route around Berkshire & Surrey, which included both motorway & dual carriageway. The ride comfort is definitely a highlight & the car handles poor road surfaces really well. The front seats are comfortable & offer that cosy feeling that French cars excel in. 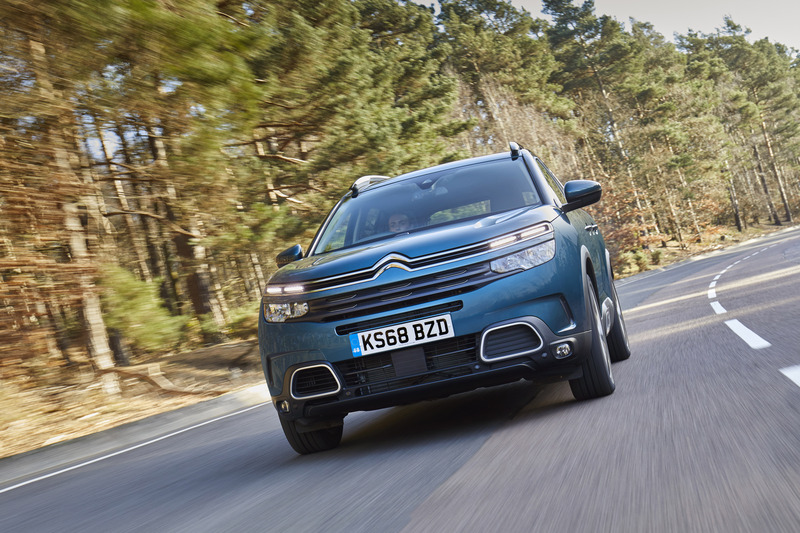 This isn’t surprising, because C5 Aircross is the second Citroen after the C4 Cactus, to feature Citroën’s new rally-derived Progressive Hydraulic Cushion suspension system, which aims to deliver “peerless comfort” & a “magic carpet ride” over uneven ground, while retaining the relaxed characteristics of the company’s long-standing hydropneumatic system. The seats too have been designed for comfort, with Advanced Comfort upholstery, unique to the European-spec C5 Aircross, which offers thicker, softer seat padding & greater adjustment. On the road, the 130 diesel performs adequately, but, as we found out later, it lacks the punch of the similarly powered petrol version. That’s not to say it won’t do the job you want it to do, but a 0-62mph time of 10.4 seconds means it’s steady rather than exciting. The short, stubby gear lever is nice to use, just as it is in sister model the Peugeot 5008. Steering is light & despite it’s high profile, there’s little or no body roll. We encountered plenty of stop-start traffic on our route & even fitted with the manual gearbox, the C5 Aircross is an easy car to live with. A light clutch, light steering & well placed controls further add to it’s charms. Of course, the petrol v diesel conundrum isn’t going anywhere, anytime soon. 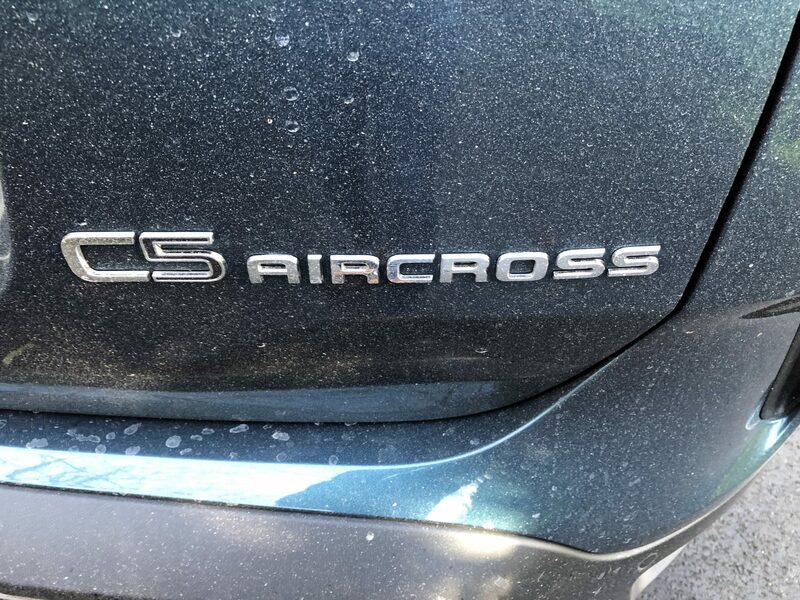 And, Citroen have covered all the bases, with the engines on offer with C5 Aircross. From Company Car & Vans point of view, it’s usually the claimed combined fuel economy that should make that decision for you. The 130 diesel offers a combined fuel economy figure of 48.2 – 55.1mpg, with the 130 petrol coming in at 44.6-51.4mpg, dependant on gear box, which are remarkably similar & are therefore, are not making that petrol/diesel decision any easier. Generally speaking, if you drive over 12,000 miles per annum & a lot of this is on the motorway, choose diesel. Lower mileage & local driving, would tend to favour a petrol engine. 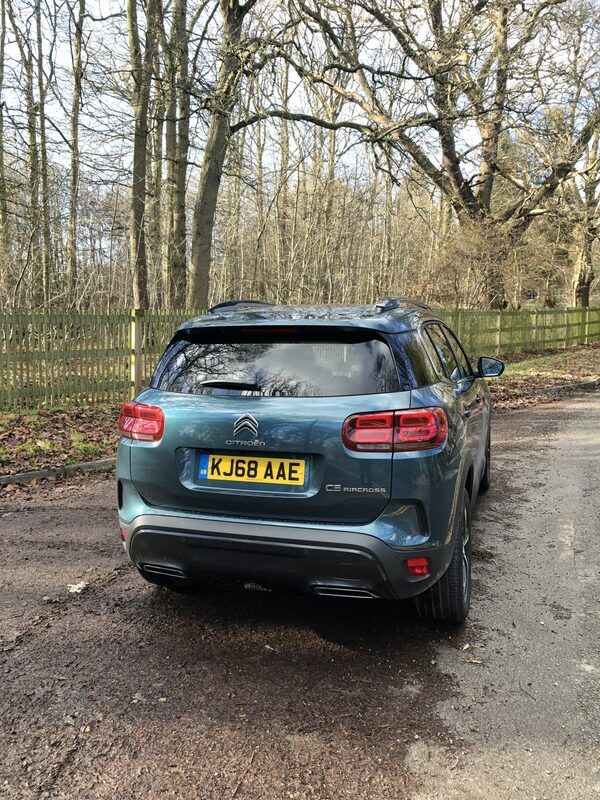 In conclusion, you won’t buy this car for it’s performance & dynamically it’s definitely middling, but if you want a competent family car that offers seating for five, loads of boot space, on trend tech, loads of safety features & is ridiculously comfortable, then the Citroen C5 Aircross should be on your list. Both the lower powered petrol & diesel engines are attractive & make the most sensible company car choice, over the larger, more powerful, more exciting engine options. 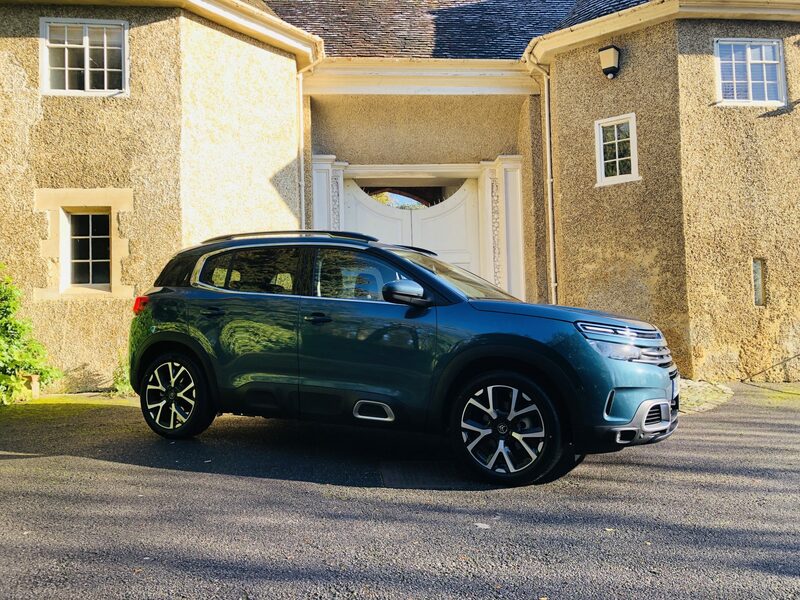 Citroen have designed a highly practical car & with a plethora of interesting colour & design combinations available, it will satisfy the customer who now has a family or leads an active lifestyle, whilst not compromising the good looks many covet from a smaller SUV or crossover.